This is the first volume in a two-volume release charting the presence of rock ‘n’ roll in the upper echelons of the US hit parade from its first substantial presence in the mid-50s through to the early 60s, by which time it had been moulded by Tin Pan Alley, re-interpreted by successive waves of new talent and influenced the artists who would bring about the next serious musical explosion with the British Invasion of the ‘60s. This great value 150-track 5-CD set encompasses the first five years or so of that process. Rock ‘n’ roll encapsulated the aspirations and instincts of the baby-boom generation as mass media and the long-awaited emergence from post-war austerity saw long-established musical strands in blues, R&B and country come together, and rebellious teenagers rejected the established norms of popular music to claim a piece of the musical high ground. 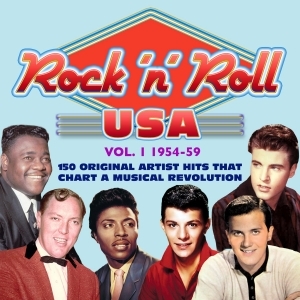 Even now, 60 years after that process crystallised with the hysteria created by Bill Haley’s “Rock Around The Clock” in the movie “The Blackboard Jungle” and the first high profile successes of Elvis Presley, the story of the rise and rise of rock ‘n’ roll still fascinates social and cultural commentators, to the extent that 2015 saw a complete season of radio and TV programmes devoted to the genre on BBC radio and TV channels in the UK. These two sets chart the presence and progress of rock ‘n’ roll insofar as it was reflected in mass popular taste in the USA through the pop record sales charts. They therefore include just about every record that could be called rock ‘n’ roll in its many forms and interpretations which made the Top 10, or close to it, in the pop charts in the USA during the stated period. There will be some debates about what was included and what was left out – that’s half the fun of the subjectivity of music – but whichever way you look at it, it makes for marvellously entertaining listening.